A dog park every dog will envy! 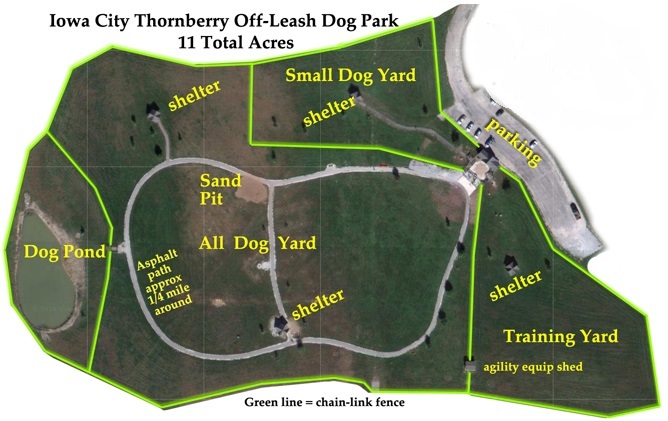 Thornberry Off-Leash Dog Park (Iowa City, IA) is a large 11 acre dog park with a lot to offer. There’s a small area for small dogs, a large field for dogs that need space, a main dog playground, a 15-foot swimming pond, and fun events for the dogs throughout the year. The park is environmentally friendly, using eco-friendly waste bags. The park is for members only and open from dawn to dusk. Otheriwse, non-member may pay a daily fee. A map is available of the park. Safety: Please follow rules and regulations provided by the dog park. Generally, dogs should be fully vaccinated and non-aggressive towards other dogs.